At the VIIth International Congress on Rheology, which was held in Goteborg in 1976, Proceedings were for the first time printed in advance and distributed to all participants at the time of the Congress. Although of course we Italians would be foolish to even try to emulate our Swedish friends as far as efficiency of organization is concerned, we decided at the very beginning that, as far as the Proceedings were concerned, the VIIIth International Congress on Rheology in Naples would follow the standards of time­ liness set by the Swedish Society of Rheology. This book is the result we have obtained. We wish to acknowledge the cooperation of Plenum Press in producing it within the very tight time schedule available. Every four years, the International Congress on Rheology represents the focal point where all rheologists meet, and the state of the art is brought up to date for everybody interested; the Proceedings represent the written record of these milestones of scientific progress in rheology. 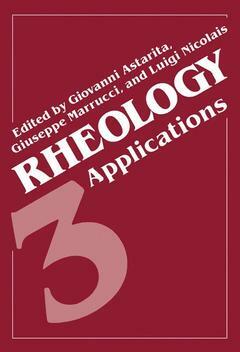 We have tried to make use of the traditions of having invited lectures, and of leaving to the organizing committee the freedom to choose the lecturers as they see fit, in order to collect a group of invited lectures which gives as broad as possible a landscape of the state of the art in every relevant area of rheology. The seventeen invited lectures are collected in the first volume of the proceedings. Polymer Processing.- PC 1.1 Non-isothermal flows of Viscoelastic Fluids.- PC 1.2 Sensitivity of the Stability of Isothermal Melt Spinning to Rheological Constitutive Assumptions.- PC 1.3 Draw Resonance Studies of Polypropylene Melts.- PC 1.4° Quantitative Investigations of Orientation Development in Vitrifying Deforming Polymer Melts with Application to Processing.- PC 1.5° Quantitative Investigations of Crystallization Kinetics and Crystalline Morphology Development in Solidifying Polymer Melts with Application to Processing.- PC 1.6 Rheology in Calendering of Thermoplastics.- PC 1.7 Flow in Injection Moulds.- PC 2.1 Characterization of Extrusion Dies by the Stress Distribution at the Die Exit and the Free Recovery of Extrudate Elements.- PC 2.2 Influence of Wall Slip in Extrusion.- PC 2.3 An Inelastic Approach to Extrudate Swelling.- PC 2.4 Time Dependency of Extrudate Swell of Molten Polyethylene.- PC 2.5 Design of Polymer Melt Extrusion Dies to Avoid Non-Uniformity of Flow.- PC 2.6 Broken Section Method for Analyzing Molten Flow in Extrusion Die of Plastic Net.- PC 2.7 Rheological Behavior, Extrusion Characteristics and Viscous Dissipation in Fiber Reinforced Polymer Melts.- PC. 3.1 Time-Dependent Rheological Behavior of Polymeric Systems.- PC 3.2 Phase Behavior and Rheological Properties of Amorphous Polymers Plasticized by Crystalline Solids.- PC. 3.3 Gelation and Fusion Characteristics of PVC Resins in Plastisol by Determination of their Viscoelasticity.- PC 3.4 Process Rheology in the Polymer Manufacturing for Synthetic Fibers.- PC 3.5/6 Multiphase Flow in Polymer Processing.- PC 3.7 Instabilities and. Disturbances on Industrial Melt Spinning.- PC 4.1 Analysis of the Stratified Multi-Phase Flow of Polymer Melts in Wire Coating.- PC 4.2 Microstructural Orientation Distribution in Injection Molded Polyethylene Articles.- PC 4.3 Melt Deformation During Parison Formation and Inflation in Extrusion Blow Molding.- PC 4.4° High Modulus Polyethylene Obtained with Injection Molding.- PC 4.5 Flow of Molten Polymers Used in the Synthetic Fibre Industry through Granular Beds.- PC 4.6° Viscoelastic Properties of Phenol-Formaldehyde Oligomers and Polymers in the Process of Cross-Linking.- Rubber.- RB 1.1 Dynamic Mechanical Properties of Thermoplastic Urethane Elastomers by Thermally Stimulated Creep.- RB 1.2 Rubber Networks Containing Unattached Polymer Molecules and Carbon Black..- RB 1.3° Determination of Constitutive Equations in Finite Elasticity.- RB 1.4° Derivation of the Plazek Time-Chain Concentration Shift Factor for Elastomers.- RB 1.5 On the Transition from Linear to Non-Linear Viscoelastic Behavior of Natural Rubbers.- RB 1.6° Effects of Curatives and Antidegradants on Flow of Uncured Rubber Compounds.- RB 1.7° Analysis of Extrudate Swell Behavior of Rubber Compounds Using Laser Scan Detector.- Solids.- SD 1.1 Viscoelastic Response of a Solid Polymer After Yielding.- SD 1.2 Dynamic Mechanical Analysis of PC-SAN Blends.- SD 1.3 Dynamic Mechanical Properties of Aromatic Polyamidemide Degraded in NO2 Atmosphere.- SD 1.4 The Appearance of Nonlinear Viscoelasticity in Glassy Polymers.- SD 1.5 The Influence of Cooling Rate on the Transition to Marked Nonlinear Viscoelasticity in Poly(Methylmethacrylate).- SD 1.6 Viscoelastic Models in the Rheology of Hybrid Polymeric Composites of (Phase-in-Phase)-in-Phase Type.- SD 2.1° Thermal Properties in Composites.- SD 2.2 Stress Relaxation of Glass-Bead Filled Glassy Amorphous Polystyrene.- SD 2.3 Failure Properties of Filled Elastomers as Determined By Strain Endurance Tests.- SD 2.4 Aging of a Structural Adhesive.- SD 2.5 The Strength of Oriented Short Fiber Reinforced Plastics.- SD 2.6 Deformation Behavior of Composite Particles.- SD 2.7 Acoustical Response of Particulate-Loaded Viscoelastic Composites.- SD 3.1 The Role of Chain Entanglements and Crystals in the Orientation Process of Polymers.- SD 3.2 Deformation Induced Volume Relaxation in a Styrene-Butadiene Copolymer.- SD 3.3 A Deformation Analysis of a Polyethylene Crystal Subjected to End Forces of Stretching and Lattice Expansion.- SD 3.4 Induced Anisotropy of Thermal Expansivity under Large Deformations.- SD 3.5 Viscoelastic Behavior of Poly(Methyl Methacrylate): Prediction of Extensional Response from Torsional Data.- SD 3.6 Dynamic Mechanical Behavior of Plasticized and Filled Polymer Systems.- SD 4.1 Properties of Compatible Blends of Polycarbonate and a Copolyester.- SD 4.2° Relaxation Processes in Glassy Polymers and the Strain and Time Dependence of Gas Permeation.- SD 4.3 Application of a Thermodynamically based Single Integral Constitutive Equation to Stress Relaxation and Yield in ABS.- SD 4.4 Irreversible Thermodynamics of Glassy Polymers.- SD 4.5 Characterizing Rheological Cure Behavior of Epoxy Composite Materials.- SD 4.6 Conformational Energies of Polymers.- SD 5.1 The Rate-dependent Fracture Behavior of High Performance Sulfone Polymers.- SD 5.2 The Influence of Crystalline Structure on the Necking-Fracture Behavior of Polyethylene.- SD 5.3° Structure and Fracture of Thermally Oxidized Pipes of High—Density Polyethylene.- SD 5.4 Fibre Fatigue in Various Environments.- SD 5.5° Creep-Fatigue Rupture Prediction Models Applied on 2 1.4 Cr-1 Mo Steel at 550°C.- SD 5.6 Ultimate Strength of Poly(Ethylene Terephtalate) Fibres and its Relation to Thermal and Mechanical History.- SD 5.7 Building of Stress-Strain Curves for Glassy Polymers on the Basis of their Dynamic Mechanical Characteristics.- SD 5.8 Kinetics of Deformation and Intermolecular Forces in Polymers.- SD 6.1/2 Measurement of Dynamic Mechanical Properties Properties.- SD 6.3 Rheo-optical Studies on the Nature of Alpha and Beta Mechanical Dispersions of Polyethylene in Relation to the Deformation Mechanisms of Spherulitic Crystalline Texture.- SD 6.4° On the Creep-Behavior of Materials under Compression Between Parallel Plates.- SD 6.5 Processing Induced Superstructures in Moulded Amorphous Polymers.- SD 6.6° Effect of Variable Molecular Orientations on Stress-Crazing in Moulded Amorphous Polymers.- SD 6.7° Viscoelastic Behavior of Composite Systems Composed of Polybutadiene Particles and Polystyrene at Elevated Temperatures.- SD 6.8 Interactive Enhancement of PVC and ABS Toughness in their Blends, A Fracture Mechanics Investigation.- SD 7.1 Environmental Crazing of Polymethylmethacrylate and Polycarbonate.- SD 7.2 Recovery of Uniaxially Oriented Polypropylene.- SD 7.3 Dimensional Stability of Uniaxially Oriented Polystyrene Composites.- SD 7.4° Mechanical Properties of High Density Polyethylene-Polypropylene Blends.- SD 7.5° Properties of Polystyrene-Polyolefin Alloys.- SD 7.6° Strain and Strength Properties of Linear Polymers at Uniaxial Extension above their Glass Transition Temperature.- Biorheology.- BR 1.1/2 Molecular Rheology of Human Blood: Its Role in Health and Disease (Today and Tomorrow? ).- BR 1.3° Analysis of Drag Reduction in Blood Flows.- BR 1.4 Augmented Rates of Oxygen Transfer to Blood under the Influence of Imposed Magnetic Fields.- BR 1.5 Mass Transfer in Time Dependent Blood Flow.- BR 1.6 Erythrocyte Elasticity in Muscular Dystrophic Mice.- BR 1.7 Kinetics and Morphology of Aggregation of Red Cells: Preparations for the NASA Spacelab.- BR 2.1° Some Rheological Aspects of Enzyme Manufacture.- BR 2.2 Synovial Fluid Rheology, Hyaluronic Acid and Macromolecular Network Structure.- BR 2.3° A Mathematical Formulation of the Growth of Biological Materials.- BR 2.4 Effects of Membrane Anisotropy upon the Viscoelasticity of Spherical Cell Suspensions.- BR 2.5 Walking, Running, Jumping — An Interaction of Two Rheological Systems.- BR 2.6 Rheological Properties of Pullulan by TS Cr.- BR 2.7 Fluid Dynamic Problems in Postdilutional Hemofiltration with High-Flux Membranes.- BR 3.1 Some Results about a New Mono-Cusp Aortic Valve Prothesis.- BR 3.2° Aspects of Measuring Techniques in Haemorheology within the Low Shear Range.- BR 3.3 Constitutive Equations for Large Human Arteries.- BR 3.4 Velocity Profile Measurements by Laser-Doppler Velocimetry (LDV) in Plane Capillaries. Comparison with Theoretical Profiles from a Two Fluid Model.- BR 3.5 An Optical Method for Studying Red Blood Cells Orientation and Aggregation in a Couette Flow of Blood Suspension.- BR 3.6° The Influence of the Internal Viscosity of Washed Red Blood Cells on their Rheological Behavior.- BR 3.7 The Quantitative Description of the Viscoelastic Properties of Human Blood.- BR 3.8° Temperature Dependency of Thixotropic Behavior of Whole Human Blood.- Miscellaneous.- MS 1.1 A Rheological Study of a Superplastic Sheet Metal Forming Process.- MS 1.2 The Rheological Assessment of Propellants.- MS 1.3° On the Plastic Deformation of Semiconductors.- MS 1.4° Rheological Properties of Treated Sub-Bentonite.- MS 1.5 Flow Behaviour of Lubricants in Service Conditions.- MS 2.1° Mechanics of Failure in Tissue Specimens of the Apple Cortex.- MS 2.2 Rheological Characterization of Time Dependent Foodstuffs.- MS 2.3 Rheological Properties of Non-Acqueous Suspensions of Titanium Dioxides Stabilized with Lecithin.- MS 2.4 Characterization of Chitosan Film.- MS 2.5 Rheological Properties of Highly Dilute Viscoelastic Aqueous Detergent Solutions.- MS 2.6 Reinforced Hydrophyllic Materials for Surgical Implants.- MS 2.7° Upon Viscoelastic Behavior of Compositions of the Type of Polymer Concrete.- MS 3.1/2 The Rheology of Polymers with Liquid Crystalline Order.- MS 3.3 A Thixotropic Model for Cement Pastes.- MS 3.4 On the Rheological Behavior of Cement Suspensions Tested in a Couette Rheometer.- MS 3.5 Correspondence Between Transient and Dynamic Viscoelastic Functions in the Case of Asphalts.- MS 3.6 The Viscoelastic Analysis of the Three Layer Paving System Subjected to Moving Loads.- MS 3.7 Prediction of the Behavior of Concrete by Means of a Rheological Law.- Late Papers.- Author Index.